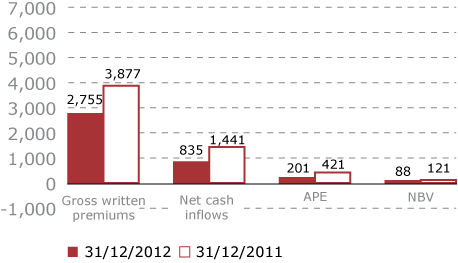 Premiums written for the life segment, including premiums related to investment contracts, totalled € 46,810 million (€ 46,394 million at 31 December 2011), with an increase (up 3.1% on equivalent terms), greater than that observed on 30 September. It should be noted that the 2011 volumes include the Migdal Group premiums written (totalling € 1,500 million), the sale of which was completed at the end of October 2012. This performance reflects the growth in savings (+5.8%) and pension lines, especially on annual premiums, and in protection policies (+3.2%). By contrast, linked business, which continued to be affected by severe financial market volatility, declined (−6.7%). 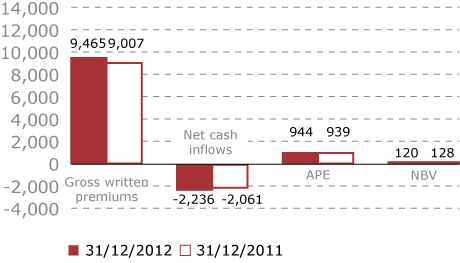 The amount of life premiums written includes the effects of the protective measures for the French savings and pension portfolio taken against the significant outflows that affected this portfolio in the fourth quarter of 2011 and the first half of 2012, in order to keep such sums within the Group aiming to re-invest them in contracts with a higher orientation towards the creation of value. Net cash inflows amounted to € 3,542 million, recovering compared to the sharp reduction reported in September. It should be noted that the amount of net cash inflows reflects the measures taken by the Group in some of the Group’s main countries of operation aimed at restoring adequate levels of profitability. Without considering such actions, the Group’s net cash inflows amounted at approximately € 6.5 billion, thus confirming the quality of the Group’s networks, even in a particularly challenging market scenario. The new production in terms of annual premium equivalents (APE) total € 4,508 million, which is essentially stable from the prior year (−1.4% at constant exchange rates and interest of the Group). The annual premiums are down (-5.1% on equivalent terms), continuing to represent more than 60% of the new production while the sole premiums, driven by the production recorded in Germany in the second half of 2012, are up (+5.0% on equivalent terms). With reference to business lines, the traditional savings and pension business grew (+5.2% on equivalent terms), while, despite the decline in the health line in Germany, the protection business declined slightly (down 2.0% on equivalent terms). The linked business also decreased (-23.4% on equivalent terms), negatively affected by volatility on the financial markets. On the Group level, the new business value (NBV) was 863 million, dropping on equivalent terms by −9.5%. The reasons for this reduction are found in the cited APE production trend (-1.4% on equivalent terms) and the negative impact of the generalized decline in the interest rates on profitability. The new business margin (NBM) went from 20.4% in 2011 to 19.2% in 2012. The internal rate of return, i.e. the rate that represents the return on shareholder investment on the new business, is kept at good levels and is 12.3%. The table above shows the major importance of savings and protection contracts (65.5% of the total), while the unit/index linked portfolio accounts for 17.3% of the total written premiums. Concerning the health business, the Group has a strong presence in markets such as Germany and Austria where operate companies dedicated to this segment; while in all the other geographical areas health premiums refers to life insurance rider covers. With reference to the distribution by geographical area, the Group, in the life and health market, is present in various countries with a relative stability in term of written premiums. However it is worth noting that the 95.9% of the total written life and health premiums refers to the European market. 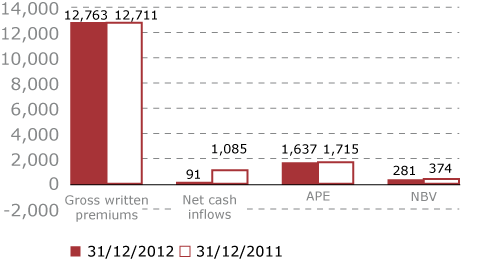 The gross premiums written in Italy went from € 12,711 million at 31 December 2011 to € 12,763 million. This performance (+0.4%), which shows a recovery compared to the previous months (-2.5% in September) thanks to the inclusion of the decline in individual policies that has been recorded in the previous months, which shows stable individual recurring-premium policies (-1.0%). With respect to individual policies, pension products gave a positive contribution, increasing by 15.0%, thanks to the initiatives launched by the Group in this segment. The contributions of collective policies and pension funds were also positive (up +9.4%). Lastly, with respect to distribution channels, premiums written of the financial advisors channel continued to grow, whereas the traditional and banking channels showed a decline (-2.1%). The decrease in new production in annual premium equivalents (−4.5% on equivalent terms) was attributable to the decline in annual premiums (-7.6% on equivalent terms), corresponding to 66.3% of APE production while the single premiums increased (+2.1% on equivalent terms). There is a 24.7% decline in the new business value following a decline in profitability (the NBM went from 21.8% in 2011 to 17.2% in 2012) due to the predominance of the savings business, more sensitive to the decline in the yields curve used in the evaluation, only in part mitigated by the reduction of the level of financial guarantees offered. Net cash inflows worsened, mainly as a result of the marked increase in maturities. The performance was affected by the decision taken in the first half of the year not to keep certain capital redemption policies of large amounts, but which did not provide adequate return, excluding which ample net cash inflows would have been achieved. Finally, it should be noted that the fourth quarter, following that observed in the third quarter, showed a positive net cash inflows. The negative trend as of 30 September 2012 inverted for the gross premiums written in France, which went from € 9,007 million as of 31 December 2011 to € 9,465 million as of 31 December 2012. These include the reclassification that occurred during the last quarter of 2012 for part of a health portfolio and a property and casualty portfolio to a protection portfolio. With reference to the business lines, the growth of savings policies (+6.5%) compensates the linked policies decrease (−27.6%), particularly single premium policies, which were affected by the volatility of financial markets, and the slight decrease in protection policies (−1.0%). It should finally be noted that the volume of premiums written in France benefited from the above-mentioned protective measures for the French savings and pension portfolio, which was affected by significant outflows in the fourth quarter of 2011 and first half of 2012. The APE remain essentially stable (+0.5% on equivalent terms) as a consequence of the traditional savings business growth compensated by the decline recorded in linked production, which continues to suffer the uncertainties of the financial markets. The new business value posts a 6.1% decline on equivalent terms and totals € 120 million with a NBM that contracts from 13.7% in 2011 to 12.8% in 2012. This decline is due to the lack of profitability associated with the products sold in the first part of the year following protective actions for the savings portfolio, compensated, in part, by the increased importance of the more profitable pension business. Negative performance for net cash inflows, which continues to be influenced by high outflows given a slight increase in the premiums written. This performance was due to the decision not to keep contracts with high premiums, the return of which was not in line with the Group's expectations and therefore not included in the portfolio protective measures undertaken at the beginning of the year. 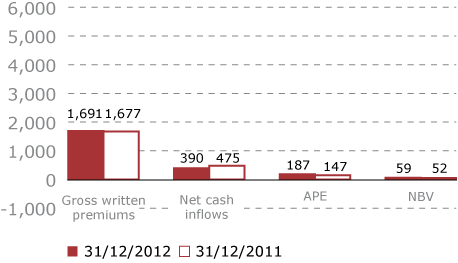 The growth observed on 30 September for the gross premiums written in Germany has continued, going from € 13,534 million to 31 December 2011 to € 14,310 million on 31 December 2012. 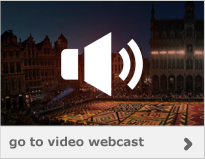 The reported growth (+5.7%) was mainly attributable, contrary to the market trend, to the increase in savings and pension policies (+14.5%), particularly single premium, and in written premiums of protection polices (+1.0%), which compensate the decline in the linked premiums (−4.1%). Compared to the growth in the life segment, limited growth in new production in terms of the annual premium equivalents has been observed (+1.0% on equivalent terms) may be attributed to the considerable downsizing of the health business, due to the decisions reached in the current market scenario to terminate commercial agreements with the brokers channel and to discontinue a specific tariff segment of that line yielding low profitability. The new business value is up 11.9% following an increase in profitability (from 18.3% in 2011 to 20.2% in 2012), which positively impacts the increased weight of the risk business in the life segment. Excellent levels of net cash inflows have been maintained thanks to the good level of premiums written and the simultaneous reduction of maturing capital. 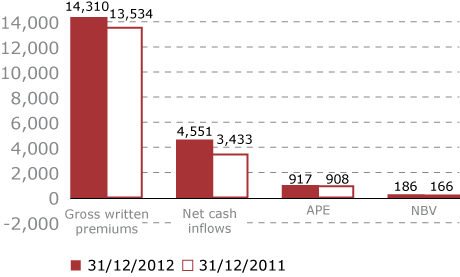 Gross written premiums in Central and Eastern Europe went from € 1,677 million at 31 December 2011 to € 1,691 million (+2.9% on equivalent terms). More specifically, growth continued both in savings and pension policies (+3.3% on equivalent terms), especially in the Czech Republic and, to a lesser extent, Russia, Poland and Serbia and the increase in protection policies (+11.4% on equivalent terms), mainly in the Czech Republic, Poland, Russia, Slovakia and Hungary, while linked polices decreased (−2.0% on equivalent terms), above all in the Czech Republic, Slovakia and Hungary. In terms of new production, there has been a marked increased (+23.6% on equivalent terms) thanks to a significant increase in annual premiums (+37.1% on equivalent terms), explained primarily by a significant production of the pension fund in the Czech Republic. The value of the new business shows an increase of 8.3% on equivalent terms with the NBM that, despite the slight decline due to the increased weight of pension production in the Czech Republic, maintains good levels (from 35.8% in 2011 to 31.4% in 2012). There is a decline in the net cash inflows compared to 31 December 2011 due to a significant decrease observed in the Czech Republic and the negative trends in Slovakia and Hungary, which offset the growth in Poland. The increase in the gross premiums written in the Rest of Europe (+3.8% on equivalent terms) thanks to the positive trends in all business lines. In particular, there was an increase in the gross premiums written in Spain that totals € 1.183 million (€ 1,052 million as of 31 December 2011); this increase (+12.5%) is due exclusively to the positive trend for savings policies written (+16.2%) while there is a slight decrease in the protection policies (−1.1%). 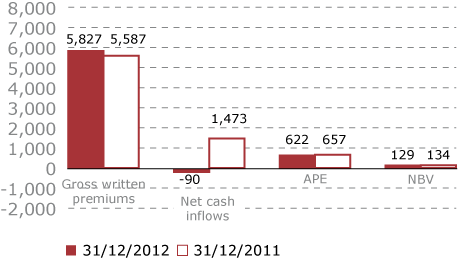 The gross premiums written for Austria total € 1,147 million (€ 1,194 million on 31 December 2011); this decline (−4.0%), despite an improvement compared to that of 30 September 2012, was mainly determined by the decline in savings and pension policies (−5.0%), for which the comparison with the same period of 2011 was impacted, in addition to market difficulties, by the presence of some contracts of significant amounts in the corporate pension segment in the previous year. Moreover, the decline of single premium products was attributable to the revision of the tax benefits provided for this type of product. Linked policies decreased (−8.8%), while contribution of protection policies was positive (+2.8%). The gross written premiums in Switzerland (+2.6% on equivalent terms) went from € 1,102 million at 31 December 2011 to € 1,157 million. This increase, slightly less than that recorded on 30 September, was attributable both to the sharp increase in savings and pension policies (+9.7% on equivalent terms), with a significant growth of single premiums, and the positive performance of protection policies (+14.2% on equivalent terms). 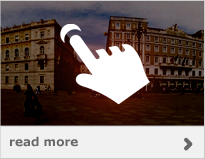 There is a slight reduction compared to 31 December 2011 in the linked business. The new production in terms of annual premium equivalents for Rest of Europe contracted (−5.5% on equivalent terms) following a negative trend recorded in Austria in particular (−6.2% on equivalent terms), this negative change influencing the presence of some significant contracts in the corporate pension segment in the first months of the previous fiscal year in Spain (−1.1% on equivalent terms) and in Guernsey (-21.8% on equivalent terms) following the negative trend of the linked products given the current market situation. By contrast, Switzerland (+6.3% on equivalent terms) and Ireland (+26.9% on equivalent terms) showed a good performance. The new business value is € 129 million, down 3.8% on equivalent terms, primarily following reduced volumes. Profitability has remained stable for NBM, which went from 20.4% in 2011 to 20.8% in 2012. The net cash inflows are down due to a negative trend in Spain that, following an increase in premiums written, show a negative trend following the decision to not renew a collective policy of approximately € 1.6 billion, which was not sufficiently profitable, occurred in the second quarter of this year. The gross premiums written for the Rest of the World post growth (+9.9% on equivalent terms); please note that the 2011 volumes include the Migdal Group premiums written (totalling € 1,500 million on 31 December 2011), the sale of which was completed in October 2012. The contribution from gross premiums written in Latin America (+10.7% on equivalent terms), the increase of which is due to both the trend for savings&pensions (+9.2% on equivalent terms) mainly in Argentina and protection policies (+16.8% on equivalent terms), observed in Mexico and Argentina, the latter having been influenced also by rising inflation. The positive trend for premiums in China has continued after the decline in the first six months of the year, which posted an increase (up +6.7% on equivalent terms) thanks to the good performance of protection policies and the increase in investment lines. The new production in terms of annual premiums equivalents was stable (+0.2% on equivalent terms), particularly thanks to the growth dynamic reported in Mexico (+32.0% on equivalent terms) and the Far East (+5.3% on equivalent terms), which offset the decline in the United States (-35.4% on equivalent terms). The new business value was € 88 million, down 9.4% on equivalent terms, primarily following a different production distribution rate in the Area countries. The profitability presented a significant increase (from 28.8% in 2011 to 44.1% in 2012) following the favourable impact of the decline in the protection business interest rates. Finally, the net cash inflows increased thanks to good performance in Argentina and China.